Chevrolet took the wraps off their latest Camaro show car to be showcased at this year’s SEMA event. 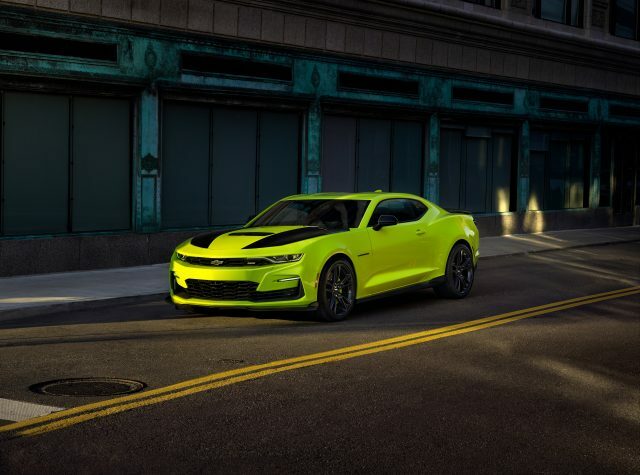 The 2019 Chevrolet Camaro SS in Shock Yellow will make its debut during the show later this month. Chevrolet is also taking the opportunity to introduce new accessories and performance parts coming from its dealer network. Exterior customization items include ground effects, a black wing spoiler, and black Camaro fender badges. Performance options include RECARO seats, a Brembo front brake upgrade kit, and 1LE suspension components. In addition to Shock, Chevrolet will be showing off other new Camaro colors such as Crush Orange, Riverside Blue Metallic, Shadow Gray, and Satin Steel Gray. New wheel designs, a new infotainment system, and a new full-display rear view mirror camera will also be shown at this year’s event. The 2018 SEMA Show runs from October 30-November 2 in Las Vegas. For more information, go to semashow.com.